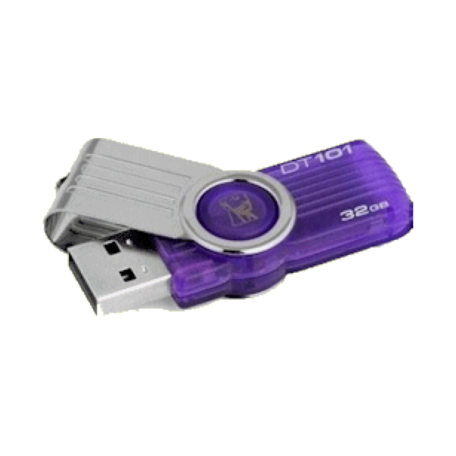 Kingston DataTraveler 101 G2 USB stick kopen? | That's IT! De Kingston USB 2.0 Mobile Disk is zo groot als je duim en weegt bijna niets! With DataTraveler® 101 G2, budget-conscious users get a combination of useful features, large capacity (up to 128GB) and an easy way to store, carry or transfer data between computers and other devices. DataTraveler 101 G2 features a capless, swivel design and is customizable with your company's logo – a great way to promote your business. It's available in multiple colors, depending on the capacity. It’s backed by a five-year warranty, free technical support and legendary Kingston reliability. In de Mobile Disk kun je 32GB aan gegevens opslaan en met je meenemen! Deze USB 2.0 variant is zeer snel, waardoor je je gegevens in een paar seconden kunt uitlezen!